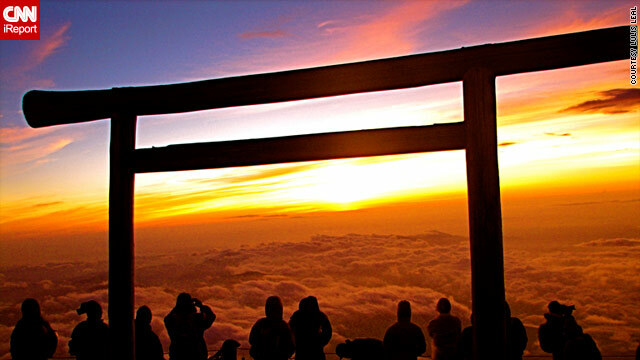 A group of tourists watch the sun rise from the top of Japan's iconic Mount Fuji. "This can be a very good opportunity to awake and to realize we need to start changing"
(CNN) -- As the nuclear crisis mounted in Japan after the one-two punch of earthquake and tsunami, announcements on the public address system at Go Watanabe's Tokyo office last week became increasingly strident. "The first day it was, 'You may go home'," said Watanabe, a 33-year-old employee at a major Japanese corporation. "On the second day it was, 'You better go home'. By the third day, it was, 'Go home'." Yet Watanabe stayed at the office as late as 2 a.m. each night to finish reports as the March end of the fiscal year loomed. Watanabe's diligence at his desk in the face of national crisis exemplifies Japan's legendary work ethic. (After all, this is a nation recognizes karoshi -- death by overwork -- as a legal cause of death.) But the three-fold disasters facing the world's third largest economy has put the global spotlight on Japan and its culture, for good and for ill. Underlining much of the coverage seems to be this question: Are the Japanese different? "The Japanese love to say it themselves -- this Nihonjinron thing, talking about 'we Japanese'," said historian John Dower, the Pulitzer-Prize winning author of "Embracing Defeat: Japan in the Wake of World War II." "The Japanese are always stressing their uniqueness ... but the very topic is fraught with peril." Much has been made of the "orderliness" in Japan following the quake. The nation's extraordinary readiness for earthquakes and tsunamis has helped keep the death toll of the March 11 disaster -- with 10,035 people confirmed dead, 17, 443 missing as of Friday -- from being far worse. But the ongoing saga at the Fukushima nuclear plant -- and the paucity of accurate, timely information even from the highest levels of government -- points to the Japanese cultural propensity for vague language and reluctance to share damaging information. Moreover, Japan watchers wonder if the event will catalyze the nation into action -- as extreme events have done so often in Japanese modern history. Aside from the immediate disaster, the country has to tackle some entrenched problems; moribund politics, a huge public debt and an aging population that has seen their nation rise phoenix-like from the ashes of World War II only to slip into a decades-long economic decline. "Well, the calmness is, of course, an enormous strength in a crisis like this. It's sometimes a problem in the recession, trying to develop a sense of urgency," Sony CEO Howard Stringer told CNN's Fareed Zakaria this week. "And a little part of me says this will now have a sense of urgency and this will kick-start the Japanese economy in ways that maybe nothing else would. "It's one of the great strengths of the Japanese people -- which one tends to forget because it's a consensus society -- and that can drive you a little crazy every so often and you think, 'Come on, let's get going'," Stringer said. Japan's volcanic geography has helped shape its culture, as limited arable land fostered tight-knit communities. "It's very much ingrained in the Japanese experience to live in close proximity with your neighbors," said Alexandra Harney, author and associate fellow at the Asia Society. "These are the values of a community-based culture; this is not an every man-for-themselves culture." Watanabe, who often travels abroad for work and has lived in North America and the Middle East, describes Japan this way: "We like rules, we like plans, and we like to make appointments. "We're famous for Sony, Panasonic and Toyota," he said. The question he's most asked abroad? "Are you a ninja?" Cultural stereotypes are hard to avoid when reporting on Japan. "I think there must be a rule at the press club in Tokyo that if you write an article about Japan, somewhere you must include the quote `The nail that sticks out gets hammered down'," said Dower, referring to a Japanese proverb that speaks of the group ethic of the nation. "I rebel against the overemphasis of notions that this is a particularly group-oriented society. There's an awful lot of idiosyncratic, individualistic response to crises over Japan's history." Still, many experts on Japan say there are very real cultural barriers that stymie the nation's emergency response to the ongoing nuclear disaster. "They're not very transparent -- there needs to be a huge change in transparency not just in the nuclear industry, but other industries," said Kei Sugaoka, a former nuclear engineer for GE who personally inspected the Fukushima plant "many, many times" from 1977 to 1997. When the third generation Japanese-American first traveled to the plant, Sugaoka was impressed by the "Army-like" efficiency of work there. "The daily meetings, the group exercise, the pep talks -- it wasn't like American plants where there was more screwing around," Sugaoka recalled. "When they go to work, they work." But in 1989 Sugaoka was shocked when he was asked to edit a video inspection that showed cracks in a steam pipe, and no service information letter sent on the incident -- a standard operating procedure. Sugaoka later went public with the information, and Tokyo Electric Power Company, or TEPCO, was found to have falsified inspections, resulting in three top executives stepping down in 2002. And yet safety violations continued at the plant. The Fukushima plant problems points toward Japan's "information problem ... the unwillingness to openly discuss bad news and to play down, disguise or even lie about unfortunate or embarrassing news," said Alex Kerr, an American who has spent much of his life in Japan. "That has been absolutely endemic in the nuclear industry here, and in other domestic industries. "There's been a lot in the international press at this point at the lack of clarity (in the Fukushima situation),"said Kerr, a cultural critic and author of "Lost Japan" and "Dogs and Demons," the latter which focused in part on Japan's nuclear problems. "What they may not be aware is its endemic and built into the system -- they simply know no other way." That sentiment can even be found in Japanese art. "They talk about the shinkei of Mount Fuji," Kerr said. "This is the perfect shape that Mount Fuji should have, the truth, an ideal -- not the actual look of Mount Fuji." Part of the blame, critics says, lies within the tangled government bureaucracy which holds sway over many of Japan's domestic industries, like nuclear power. This is evident in the aftermath of the quake. Hannah Beech, in an article this week for Time, points to Japan's fondness for red tape choking relief efforts: drugs, logistic companies and helicopter aid were rebuffed for lack of proper licenses. "In other natural disasters that I've covered, steady streams of local and international aid have usually converged upon the stricken area within four days of the event. This has happened even in developing-world countries with far less infrastructure than Japan has. But in Tohoku, as Japan's northeast is called, aid has trickled in agonizingly slowly," Beech wrote. Many times during Japan's history, the nation has made dramatic progress. The arrival of U.S. warships led by Commodore Matthew Perry in 1853 to open trade with Japan led to a crash-program of modernization. "When you look at Japan in the modern world, since Perry, the country has pulled together in quite remarkable ways in many decisive moments," Dower said. "It responded to Western imperialism and colonialism so successfully it became an imperialistic society itself. "Less than a half century later, it's knocked off Russia, it's got what we call Taiwan as a colony, Korea as a colony -- by World War I it was one of the world's Big Five Powers," Dower said. The devastation of the 1923 Kanto earthquake -- so complete, many archival pictures misdate photos from the era as World War II -- led to an incredible boom. "People everywhere were talking about a new Japan, and these energies were coming from every direction: entrepreneurs, skilled labor, artists, filmmakers," Dower said. "But, they also go nuts -- the response to that crisis also led to militarism and expansion overseas, and of course that ends in disaster." World War II left more than 60 major Japanese cities in ruins, left 10 million homeless and killed an estimated half million civilians. And yet entrepreneurs from the street level to the major corporations turned swords into ploughshares, rocketing the economy to the world's second largest by 1968. Some believed Japan was on pace to overtake the United States until its property bubble burst in the late 1980s, starting a long decline from which the nation has never quite recovered. In Tokyo last week, Watanabe and the rest of Tokyo residents experienced the first planned power cut since World War II. The scenes from the areas of devastation, the run on bottled water in Tokyo and the power outages have shaken Watanabe from his comfortable life living in one of the world's great cities. "I've traveled to many poor countries, and the earthquake shocked me in a sense that these sort of things shouldn't be taken for granted," Watanabe said. "You may run out of water; you may run out of food." It's that shock that Sony's Stringer hopes will push the nation as a whole out of its long decline. "This will jolt us out of the complacency which is kind of the love child of all this prosperity," Stringer said. "There's a sense of why would you live anywhere else? We have everything. It's comfortable. Everything works so well that developing -- as I said earlier -- a sense of urgency is critical." For Watanabe, the calls to curtail power gave him a sense of pride. "I feel a lot of hope if we can stick together," Watanabe said. "I realized we can do something together, that was a light in the darkness. This can be a very good opportunity to awake and to realize we need to start changing." And then Watanabe hung up the phone -- a short break in the midst of another long night in the office.